The Federal Reserve plans to drop several interest rates from its usual reporting in the coming weeks, including one index used for calculating the expected interest rate for reverse mortgages. Industry members, however, don’t anticipate an adverse effect on lenders’ day-to-day operations as a result. Late last week, the Federal Reserve Board indicated that it would cease publication of interest rate swaps, including the 10-Year LIBOR Swap Rate, within its weekly Selected Interest Rates (H.15) report. Effective October 11, 2016, rates for Eurodollar deposits, corporate bonds, conventional mortgages, as well as state and local bonds will also be excluded from the H.15. The Fed, however, will continue to publish the interest rate swaps for two more weeks, before discontinuing them on October 31, 2016. While the change presents a slight hiccup for reverse mortgage lenders to overcome, the industry awaits further guidance from the Department of Housing and Urban Development (HUD) on how to proceed with calculating the expected rate for LIBOR-based Home Equity Conversion Mortgages (HECMs). In a Mortgagee Letter published in 2007, HUD points to the Fed’s H.15 report as the primary source for HECM mortgagees using the 10-Year LIBOR swap rate to calculate the expected interest rate on LIBOR-indexed HECMs. But with the Fed terminating publication of the 10-Year LIBOR Swap Rate in just two weeks, HUD now must provide guidance that tells the reverse mortgage industry what the new primary source will be for calculating the HECM expected rate, since the H.15 will no longer be the go-to source. “HUD needs to provide us the exact guidance—all the guidance tells us [now] is to get the 10-Year Swap in the H.15,” said Jeff Birdsell, vice president of professional services for ReverseVision, which has already begun notifying users of its RV Exchange loan origination software about the Fed’s recent decision to drop swap rates from the H.15. While the company doesn’t expect this change will have an adverse impact on its users, Birdsell hypothesizes that there could be an effect on lenders’ secondary market teams and other software providers that use the 10-YEAR LIBOR Swap in their systems for projection purposes. The H.15 is published every business day at 4:15 p.m. Eastern, excluding holidays, according to the Federal Reserve. In the meantime, the two-week grace period provides HUD and the reverse mortgage industry with more breathing room to prepare for this change than it would have had if the discontinuance took effect this week. 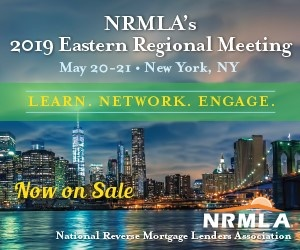 “NRMLA is relieved that the Federal Reserve granted a reprieve and agreed to publish the 10-Year LIBOR swap rates now for the next couple of weeks while the industry works to find a solution to gathering this index,” said the National Reverse Mortgage Lenders Association in a statement provided to RMD. The 1-Year LIBOR and the 1-Month LIBOR rates will continue to be published by The Wall Street Journal.